Click on this link (http://bit.ly/MktgTechChart). 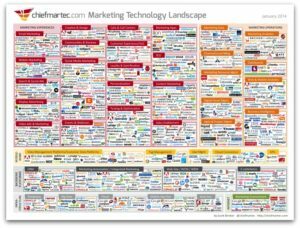 I came across this chart recently and my jaw just dropped… hundreds and hundreds of technology products and services – each focused on a particular niche within the continuum of marketing activities. And I am unfamiliar with a large percentage of them… and that’s saying something for an old marketing dog like me. I’m not suggesting that these technologies aren’t necessary or even unimportant… but the sheer quantity of options “makes your head spin!” Good luck finding the ones that are the best fit for your business. I believe, however, there’s an even bigger issue. With all of the focus and emphasis given to these tools… is it taking our eyes off of the core aspects of marketing – strategy and planning. Worse… is it minimizing the value of them? Those tools are all about doing… not about thinking. Have we gotten so wrapped up in finding the next “cool tool” that we’ve forgotten the fundamentals and the process of marketing? So, by all means, take advantage of the technology that’s been developed to help us marketers be better, faster and more efficient than ever before… but never forget that the technology is just an instrument to help us execute our plan and support our strategies.